Q: I need to watch the tutorials as most written instructions don't say enough. And if i do happen to find written instructions i need to be able to print them to read as i try it in PSE. Your instructions don't print all of it. Your videos don't work. The sign that comes up says "Windows Media Player cannot play the file. The player might not support the file type or might not support the codec that was used to compress the file"
Helppppp. I so want to learn to make cool digital art. I am totally lost with "my pictures" full of PS files that have crawling ants marching around them. I dont want to open those files anymore as they as my computer beeps when I try to save them. I just don't know what to do despite buying "100 Simplified tips and treats for PS Elements 8" I spent hours in the store looking through Dummies books and getting no answers. Most books cost about $50.00 in Canada and i paid $129.00 for PSE 8. I can'ty buy anymore and don't imagine the $20.00 rebate is eligible in Canada....It is soooo frustrating to not find a book or learning tutorial or instructions that are for BEGINNERS. I am so tired of this and the mess I have here in my pictures files. Need tutorials I can use......PLEASE help! A: I'm sorry you've experienced so much frustration with my website Pavel. It's frustrating enough trying to learn Photoshop Elements when everything is presented in a smooth manner. refer to are showing that you have made a selection. Maybe you didn't mean to make a selection, but if you had the Marquee tool selected in the Toolbox and you tried to draw on your photo it would create a selection. When you create a selection it is indicated by what are commonly called "marching ants". To get rid of them go up to the Select menu and choose Deselect. As for the information in the tutorials I can only suggest that maybe you could jot down some notes as you read through the tutorials. I urge you to just be patient and try one thing at a time and you will be able to learn Photoshop Elements. 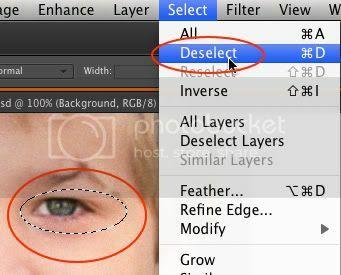 If you have a photo that's not perfectly straight, go to the Straighten Tool Tutorial. It's a pretty short lesson on how to straighten your photos. Now you know how to straighten a crooked photo with Photoshop Elements. But more important you gained some success and experience with using Elements. Now if you can find a photo that could use more contrast go to the Add Contrast Tutorial. Apply those easy-to-follow steps to your own photo. Now not only have you improved the look of your photo, but you also got some experience creating a new Layer and using a Blend Mode with Photoshop Elements. Gradually you'll gain more confidence and enjoy using the program more. And if you can't find the help you need on my site, do a search on Google and You'll probably find what you need. Just remember, if you give up you will be 100% guaranteed not to learn how to use Photoshop Elements. But as long as you keep trying you are sure to make progress. Good luck Pavel. Let us know of your progress! We all have been where you are right now at one time in our lives - trying to understand elements and all the confusion that goes with it when we first begin on a project. Please understand and realize that it take willingness, an open mind, and a stead fast desire to learn specific steps in elements that builds confidence and self as-steam within yourself. I don't know how old you are but, surly you remember your school days. How you were a bit afraid of trying something new because you knew what you were about to do wouldn't come easy. Well, it's a lot like that. If you want to learn, you have to try again and again - over and over tell something clicks upstairs. You are only as good (with elements or life) as your shills and abilities make you. Learning elements is a process, a process of learning the basics and building from there. I can not tell you how many times I tried a new tutorial and failed miserably, but I'm not a quitter. I try that step over again and again until I have it pretty well down. If for some reason, I can't get the result I want, I ask questions. I'm not saying I'll remember every step I've learned - but it helps to know how I got to a certain point in my projects. We learn by doing; if doing means repetition then that is what you must do. So, with the information highway at your fingertips, I suggest you take your time, watch and read basic tutorials over and over if necessary. If you don't understand something or your steps are not taking you to where you need to go; reread the tutorial again. Sometimes a word or phrase didn't register or make sense the first time around - read the material again. If you fall flat on your face, I mean you don't have the foggiest idea how to proceed, read and try again until you understand what you did wrong. Ever hear the saying "practice makes perfect"? Well? There are may forums (places to ask questions) out there with intelligent people that are willing to share there intellect with all who ask for help and most are free. With this in mind, your not required to go to collage, spend hours in a class room in front of a professor, taking copious notes, and last but not least, required to receive a better than passing grade. You learn at your own pace, how easy it that! If you'd like more help or direction, let me know. I have several sources (web sites) I think are good and I am willing to share. I wish you the very best luck in your endeavor. I have had Elements 8 for close on 6 months now & find it nearly impossible to follow. At first when I opened the program there was a video tutorial box which has now disappeared.All I see now is two boxes, Organise and Edit, on the left and the girl logo on the right side. I have purchased the book P/S Elements 8 for dummies & also Elements Essential as a plug-in. Now I am more confused than ever and find this software extremely frustrating & feel like tearing my hair out when what I see in tutorials & read don't actually correspond. I purchased P/S Elements 8 to replace my ageing Paintshop which is extremely simple to navigate by comparison. Surely this program could be simplified for dummies like me who have no prior experience with the Photoshop system? Do you have the ability of taking a picture of your desktop so we can see what you are having trouble with? They say a picture is worth a thousand words - well now days that is more true than ever. If possible, can you do this; take a picture of your desktop problem and use this site to post here on this forum. Using the web site below, one can upload pictures (photos of any subject) to this forum or any other. 2. Click "Choose File" button (just to the right of "your image"). 3. Navigate to where your photo is stored, click on the photo you wish to upload - at the bottom of the page, click on the "Choose" button. 4. You are at the Pixentral site with the path to your photo shown in the former blank area (immediately to the the right of the "Choose File" button). 5. Click the "Send" button (just to the right of your photo to be uploaded). 6. Once your photo is uploaded (you'll see it on the screen - it may take a moment or two) - scroll down to the bottom of the photo where you'll see two lines of text inside boxes, one says "HTML" and the other says "Forum". 7. Copy all of the text in the "Forum" box. (Highlight all of the forum text by triple clicking on the text or drag your mouse all the way from the first character to the last character of the text - be sure all of the info is copied or it will not work). 8. Click Command "C" to copy it. 9. Go to your forum, paste your link (click Command "V"). 10. Preview everything before you submit it by clicking the "Preview Post" button at the bottom of the forum. 13. If it looks okay, press the Submit Reply or Save button to send it along with any text you have included on the forum. 14 You have now posted to a forum. PS - I'm a Mac person, you'll be able to post any photo even when using a PC. Just follow the instructions. i have tried for several months to understand Photoshop Elements 8 but find that the tutorials and the instructions in Photoshop Elements 8 for Dummies book make it all sound so easy................but it aint. I have now decided to stick with my ageing Paintshop as it is far simpler. Buying Photoshop Elements, then followed up with the add-on, Photoshop Essentials was a bad mistake and total waste of money.